And we have OREOS! On our minds and in our mouths. It’s going to be a good weekend. I made these little beauties as a knee-jerk reaction to a few things that happened this week. First, I ran my credit card through the washing machine, so that was fun for everyone. Then I made friends with a giant spider crawling up the wall of my bedroom (totally awesome) and, finally, a bunch of the (very lovely, I might add) wedding invitations I sent out last week showed up in my mailbox, all marked-up and ugly-like, because the post office is a big fat idiot. I’d like to return YOU to sender, post office. 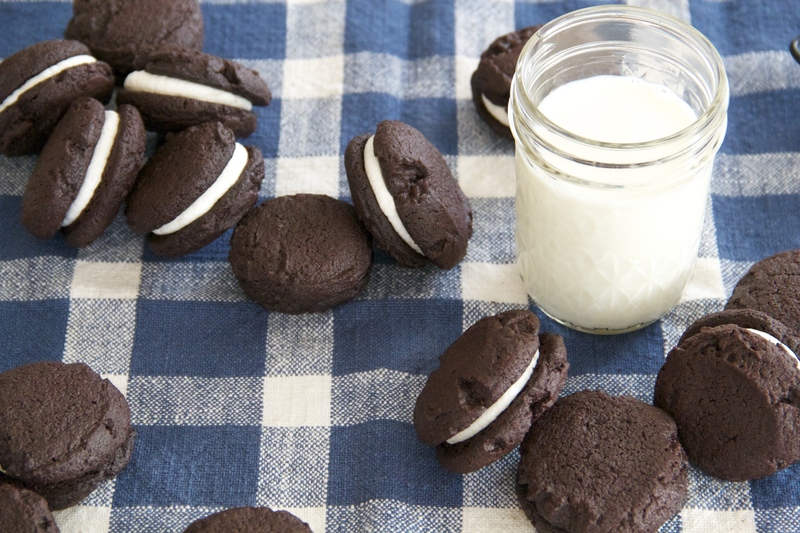 And then shove like 5 homemade Oreos (fauxreos?) in my face. 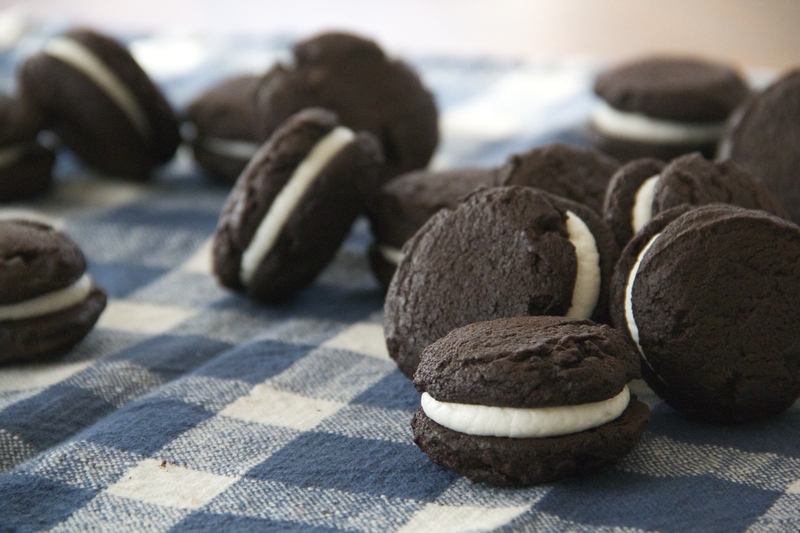 I’ve been wanting to make my own Oreos for awhile now, but never went for it because it seemed like kind of a hassle. For the record, it’s totally not. The simple dough comes together (without the help of an electric mixer, I might add) quickly, and the cream filling is a breeze of butter and sugar. And the real secret here? …Salt. (Kosher salt.) There’s a generous amount of it in the chocolate cookie dough, and then an extra pinch is whisked into the filling, too. It really helps balance the sweetness of the cookie and compliment the deep, dark chocolate flavor we’re going for. Melt the butter in a small saucepan over medium heat. Once melted, remove the pan from the heat and stir in the chocolate chips, until the chocolate has melted and the mixture is smooth. Transfer to a large bowl, whisk in the sugar and vanilla, and set the mixture aside to cool slightly. In a smaller bowl, whisk together the flour, cocoa powder, salt and baking soda. Once the melted butter/chocolate mixture has cooled to the touch, whisk in the egg until smooth. Add the dry ingredients to the wet, and stir together with a rubber spatula until a thick chocolate dough comes together. Cover the bowl with plastic wrap and allow the cookie dough to chill for 30-60 minutes in the refrigerator. When you’re ready to bake off the cookies, heat the oven to 325 degrees F, and line a cookie sheet (or 2) with parchment paper. Use a small scoop (about 1 1/4-inch in diameter) to measure out balls of cookie dough, spacing them evenly apart on the prepared pan. Press the dough rounds gently with the heel of your hand to flatten slightly. Bake the cookies for 15 minutes, rotating them halfway through baking, until the centers feel dry to the touch (since they’re dark and chocolatey, you won’t be able to tell doneness by color). Repeat with remaining cookie dough, allowing the cookies to cool completely once done. While the cookies cool, mix up the cream filling: use a stand mixer to beat together the butter and confectioner’s sugar until completely smooth and creamy. Add the vanilla, milk, and salt, and beat again until smooth. 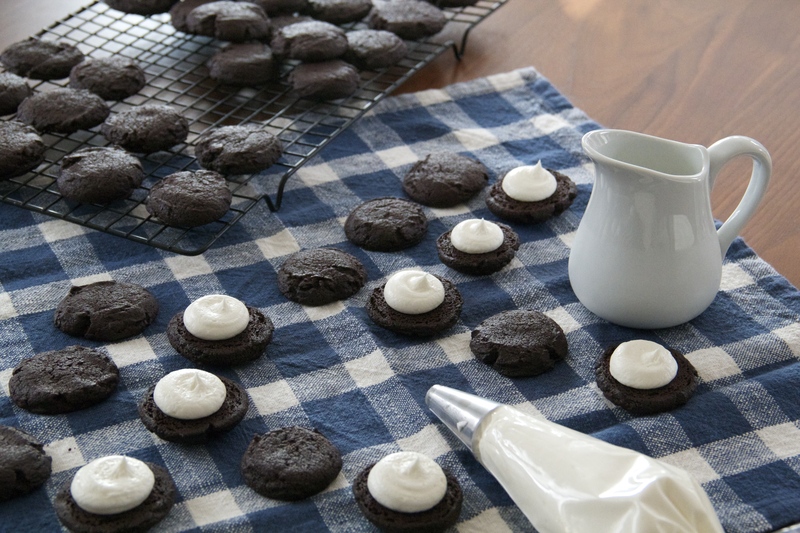 Transfer the filling to a piping bag, and pipe dollops of vanilla cream onto the flat sides of half of the cooled, chocolate cookies (alternatively, you could just use a spoon to dollop the cream on the cookies). Sandwich the Oreos closed with the remaining chocolate cookies, then ENJOY! 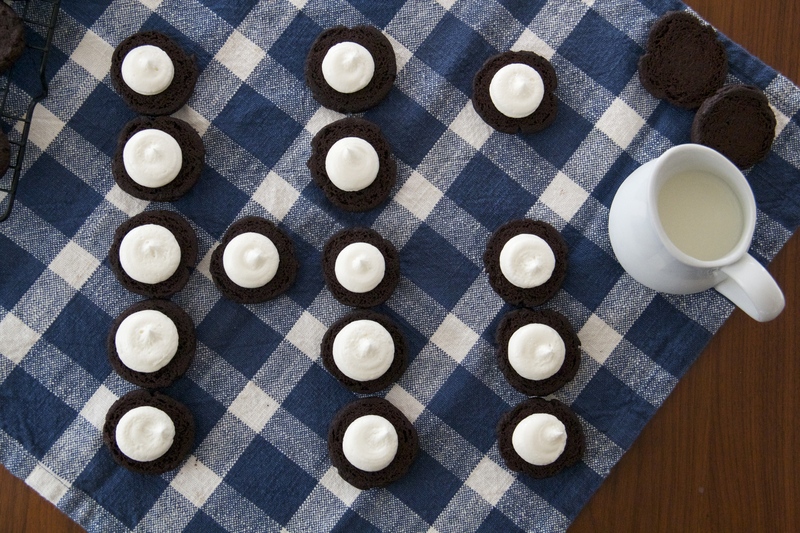 Oreos keep, well-wrapped at room temperature, for about a week. And also congrats on your engagement–so exciting! These fauxoreos look great! And I feel your pain… Hate getting mail sent back to sender, especially when it’s an invitation to your wedding… Hate when that happens… !! 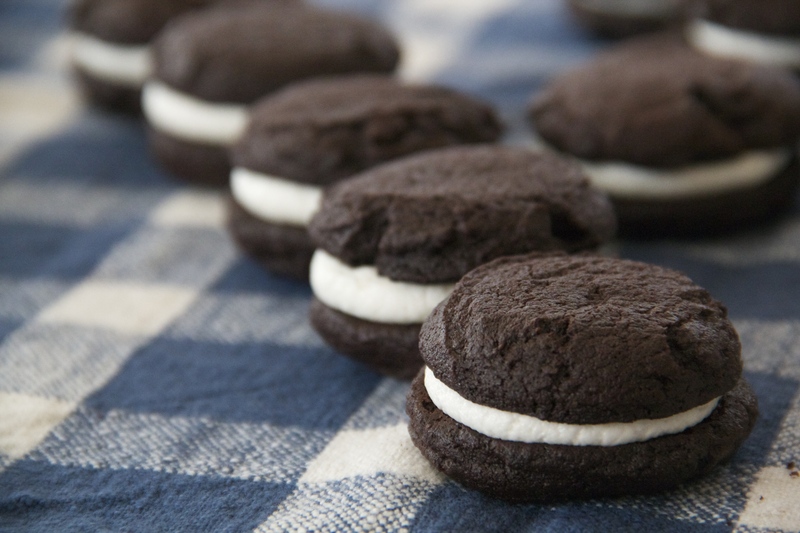 I’ve been wanting to try making homemade oreos for a while, this recipe looks like a breeze I think I’ll give it a go! Let me know how it goes, Laura!